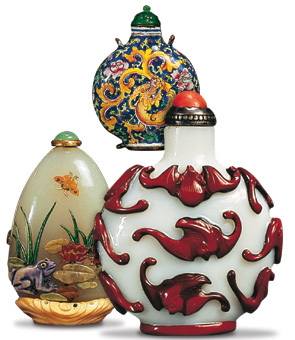 There's no genie in a Chinese snuff bottle, but it's easy to see why these exquisite little phials  the height of fashion in 18th century Beijing  cast a spell on collectors today. Handcrafted from every material known to the Qing dynasty (1644-1911), including copper, glass, porcelain, jade, ivory and amber, each one is a miniature masterpiece of the applied arts. Rich in symbolism  achieved through decorative techniques such as enameling, stippling and relief carving  they served as courtly gifts and good-luck charms. And their social significance wasn't to be sneezed at.